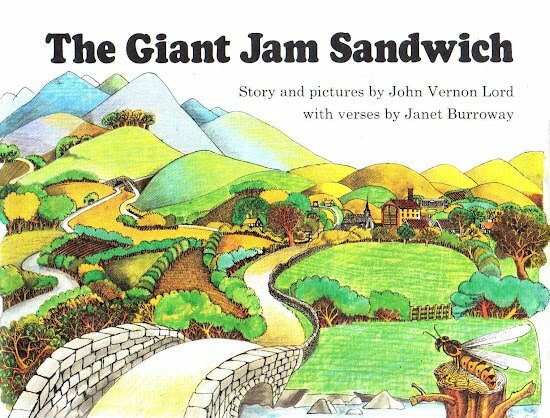 Who wants a vintage hardback copy of The Giant Jam Sandwich? That's the book up for grabs in this week's Great Monday Give. All you have to do to be entered to win is comment on this post before Sunday (April 22) at 11:59 PM CT. A winner will be selected at random and announced the next morning. The winner of last week's give of the Little Fur Family is Cathy. Send me your info to webe(at)soon(dot)com, and I'll get it out to you. Great giveaway! I'd love to have this book. Sweet! I want to win. This one makes my kids laugh out loud! Looks like such a fun book! Thanks for the chance to win it. I've been wanting to read this one to my daughter. Haven't read it in so long! Yummy book! Please throw my name into the hat :). I'm always looking for a good story about food for toddler, who'd rather read than eat. That is a very beautiful give away. I really think that the story book is wonderful too. That books is totally excellent! I would love to have a copy! Thanks! We'd love to read this! Please enter me into this one too! LOVE this book- would absolutely love a vintage copy. Thanks! Did a Bear Just Walk There? Great Monday Give: Aardvarks, Disembark! Reminder of Etsy Sale and More Books!